It’s your special day! If you’re looking to get the entire wedding party together in one vehicle, a popular option for wedding transportation is chartering a limo bus motorcoach or luxury wedding bus. People are also using charter motorcoaches to transport wedding guests from the ceremony to the reception, to the picture location, or to and from the airport. With our wedding transportation options, you never have to worry about the safety of the people you love. We’re here to take care of them! 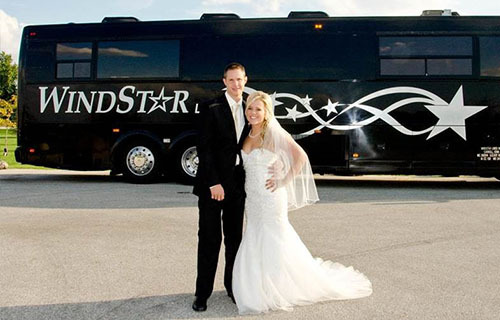 Take the stress out of wedding transportion and consider wedding bus rentals with Windstar! We’ll get you to the church on time and everywhere else, too! What sets our wedding transportation apart from the rest? View our fleet to help decide which option will work best for your wedding.